CAMP STANLEY – He had been learning taekwondo for a while but now, on a cloudy Saturday at Camp Stanley recently, Pfc. Brandon Mooreerbe was facing his first tournament. He was one of about two dozen soldiers who signed up for the 2011 Warrior Country Taekwondo Championship held Oct. 22 at the Camp Stanley Fitness Center. Mooreerbe, 21, of Brownsburg, Ind., knew that he’d be facing an especially aggressive opponent, Pfc. Christopher Brown, 23, of Chicago’s South Side. 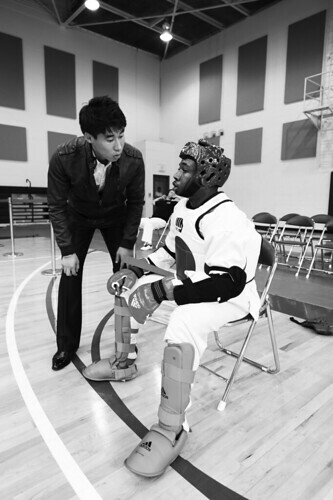 Both were members of the 2nd Infantry Division‘s taekwondo demonstration team, and both were heading into their first tournament, in the red belt 140 – 159 pound class. Mooreerbe knew Brown would likely come on like a wolverine. Brown fought three opponents that day. And yes, Brown attacked quickly and a lot. He’d close fast and unleash a storm of blows. The kicks came in flurries and struck his opponents’ protective padding with quick, sharp thuds. In the match with Mooreerbe, Brown got off a sharp kick to the head, then another. “He was droppin’ his guard and I knew I could hit him with a good-to-go head shot,” said Brown. Brown won all three matches and took first place in his red belt weight class. For Mooreerbe, the first tournament was an important training experience. Red belt, 140 – 159 lbs: Christopher Brown, Headquarters and Headquarters Support Company, Division Special Troops Battalion; Red belt, 160 – 179 lbs: An Jae-hee, Headquarters and Headquarters Support Company, Division Special Troops Battalion; Blue belt, 160 – 179 lbs: Kevin Stewart, Company D, 6th Battalion, 37th Field Artillery Regiment; Black belt, 160 – 179 lbs: Roman Stanfill, Headquarters and Headquarters Support Company, Division Special Troops Battalion.